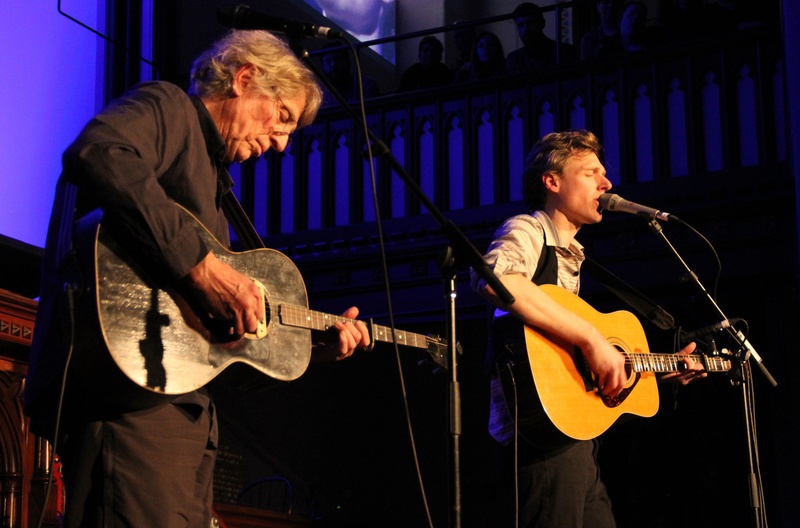 Playing with his father in Fredericton for the first time since his 2009 Three tour, Joel Plaskett was specifically asked by the Shivering Songs organizers to reunite with Bill onstage for this year's festival. Opening with the relatively dark "Heartless, Heartless, Heartless," the duo started with songs mostly from Three, quickly picking up the set with "Through & Through & Through." Their set changed on the fly to include the apt, but unpracticed "Pine, Pine, Pine," and given the setting of the Wilmot United Church, it seemed they struggled with attempting to avoid curse words. As they played on, Joel suggested that while the Emergency are getting together again soon, they probably won't be allowed in churches. Not quite as extroverted as his son (or at least trying not to take up more than of his fair share of the stage), Bill Plaskett delivered a fantastic original song, then left his son alone to his own devices for a segment that featured a number of crowd singalongs. Returning later with Jenn Grant and Daniel Ledwell for an impressively drawn out "Winnipeeeeg" during "Wishful Thinking," though, Bill's presence on stage seemed to allow Joel to strike a balance between letting loose and staying grounded. At this point in his career, having sold out every Maritime venue imaginable, Joel Plaskett is beyond Halifamous. Adding a troubadour amongst the ranks of Rick Mercer, Ellen Page and Sidney Crosby, he is Atlantic Canadian royalty. With his father present in the picture, however, it seems he's still only the heir apparent to Bill — a man we hope Joel can get writing, recording, and performing in his own right.